View of Amer Fort near Jaipur, in India’s Rajasthan State. 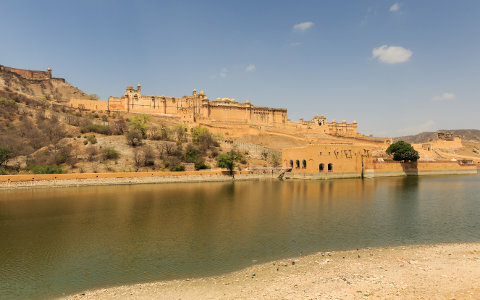 Amer Fort is thought to have been originally built around the year 967 by the Meena tribe. It fell to the Rajputs after they treacherously accepted Meena hospitality during Diwali and took advantage of the Pitra Trapan ceremony – when the Meenas customarily bathed and were thus without weapons – to massacre their hosts. The Fort consists of four major courtyards and surrounding rooms. It was the seat of the Rajput kings until they moved their capital to Jaipur in 1727. It’s full of ornate and intricate architectural details and embellishments and is also known as Amer Palace, a title it richly deserves. It’s been a UNESCO World Heritage Site since 2013, when it was added along with five other Rajasthan forts as a serial cultural heritage property. This entry was posted	on Saturday 28 May 2016 at 15:08	and is filed under 2016, India. You can follow any responses to this entry through the RSS 2.0 feed. You can leave a response, or trackback from your own site.